Hungarian writer; born at Liptó-Szent-Miklós Oct. 6, 1835; educated in the Talmud at his native city, at Presburg, and at Sátoralja Ujhely. In 1858 he went to Prague, where he attended Rapoport's lectures, and then taught successively at the Jewish schools in Szegzárd, Hód Mezö Vásárhely, and Alt-Ofen. When, in 1870, the Jewish school of the last-named community was made a municipal common school, Pollak was retained in his position, which he continued to hold until he was pensioned in 1902. Pollak has been a prolific writer. Besides several text-books, one of which, a geometry for public schools, has passed through eight editions (1st ed. 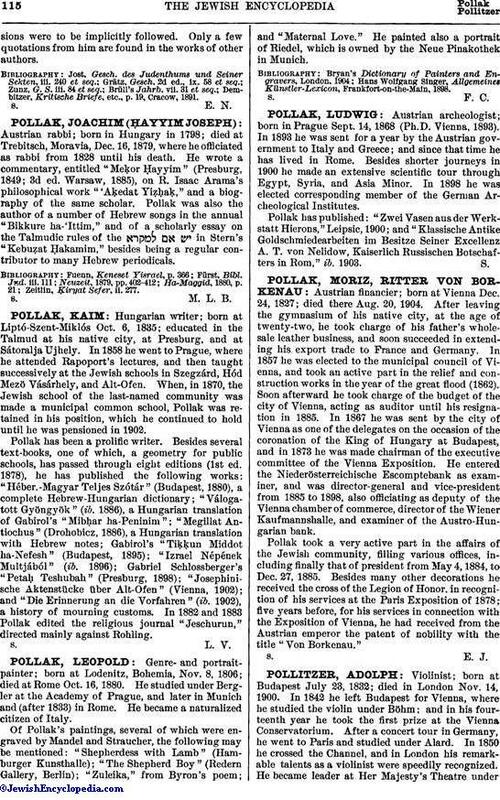 1878), he has published the following works: "Héber.-Magyar Teljes Szótár" (Budapest, 1880), a complete Hebrew-Hungarian dictionary; "Válogatott Gyöngyök" (ib. 1886), a Hungarian translation of Gabirol's "Mibḥar ha-Peninim"; "Megillat Antiochus" (Drohobicz, 1886), a Hungarian translation with Hebrew notes; Gabirol's "Tiḳḳun Middot ha-Nefesh" (Budapest, 1895); "Izrael Népének Multjából" (ib. 1896); Gabriel Schlossberger's "Petaḥ Teshubah" (Presburg, 1898); "Josephinische Aktenstücke über Alt-Ofen" (Vienna, 1902); and "Die Erinnerung an die Vorfahren" (ib. 1902), a history of mourning customs. In 1882 and 1883 Pollak edited the religious journal "Jeschurun," directed mainly against Rohling.